LONG BEACH, Calif. (April 14, 2019) – Grand Prix Association of Long Beach officials announced that preliminary indications are that attendance at the 45th Acura Grand Prix of Long Beach was up around one percent over the 2018 race. “Awaiting the final audit, it appears that this year’s event exceeded last year’s total of 185,300, which should put the total for this year’s event at about 187,000,” said Jim Michaelian, Grand Prix Association President and CEO. LONG BEACH, Calif. (April 5, 2019) – Los Angeles Chargers Head Coach Anthony Lynn will say the most famous words in racing, “Drivers, start your engines!” as Grand Marshal for the 45th Acura Grand Prix of Long Beach, just prior to the NTT IndyCar Series race on Sunday, April 14. Lynn, a native of Celina, Tex., was an All-Southwest Conference running back as a collegian at Texas Tech, which helped him earn a ticket to the NFL where he signed with the New York Giants as an undrafted free agent in 1992. His pro career also included stops in San Francisco and Denver, where he concluded his career with back-to-back Super Bowl championships (XXXII and XXXIII) in 1998 and 1999. On Jan. 13, 2017, the Chargers named Lynn the 16th head coach in franchise history, becoming the team’s first African-American head coach. Lynn joined the Chargers after spending the 2015-16 seasons with the Buffalo Bills as the assistant head coach, running backs coach and holding the positions of offensive coordinator and interim head coach. Last year in just his second season, Lynn led the Chargers to their first playoff appearance since 2013 and their best record since 2009 by posting a 12-4 mark. The Chargers also led the NFL with seven Pro Bowl selections and won a remarkable eight straight road games. For his efforts in 2018, Lynn was recognized by the Fritz Pollard Alliance with the Paul “Tank” Younger Award and was later tabbed the Coach of the Year by the Los Angeles Sports Council. In two seasons with the organization, Lynn has compiled a 21-11 regular season record. Alongside Lynn on Sunday afternoon will be “King of the Beach” Al Unser Jr., who will wave the green flag as Honorary Starter for the IndyCar race. Unser, an Albuquerque, N.M.-native ran 15 Indy car races on the streets of Long Beach, winning a record six times, including an unprecedented four straight from 1988-91, and holds the overall record for laps led here, with 545. Unser, a two-time Indianapolis 500 winner (1992, 1994) was CART series champion in 1990 and 1994, and his 34 career Indy car wins places him ninth all-time. Ticket prices for Sunday start at $70 for a General Admission ticket. Three-day tickets, pre-paid parking packages, handicapped seating, IndyCar Series Paddock access passes, Super Photo tickets and an array of VIP Club packages are also available. Fans can select and pay for their 2019 Acura Grand Prix of Long Beach tickets, parking and paddock passes online at gplb.com. Ticket orders can also be placed by calling the toll-free ticket hotline, (888) 827-7333. Fans can also follow the Acura Grand Prix of Long Beach on Facebook at GrandPrixLB, Twitter @GPLongBeach, Instagram at GPLongBeach and YouTube at GPLongBeach. LONG BEACH, Calif. (Feb. 28, 2019) – On Sunday, March 31, racing fans and runners of all skill levels will have the opportunity to “run the course” at the Second Annual Grand Prix 5K, which will benefit the Grand Prix Foundation of Long Beach. Participants will run a two-lap tour of the world-famous Acura Grand Prix of Long Beach race course, with the start at the official Grand Prix start/finish line on Shoreline Drive, then heading up Pine Avenue and Seaside Way, returning to Shoreline Drive. New this year, there will be two races: the Elite/Pro 5K (those who can finish the race in under 25 minutes) which will start at 7:30 a.m. and the run for the general public will begin at 8:00 a.m. Registration is now open for the Grand Prix 5K at thegrandprix5k.com, with the entry fee $40 per person until March 27, when the fee goes up to $45 through race day. The entry fee entitles each paid runner a finisher medal, an inaugural Grand Prix 5K t-shirt and a complimentary Friday general admission ticket to the Acura Grand Prix of Long Beach, a $33 value. In addition, there will be activities in the 5K festival area at the conclusion of the run. Grand Prix 5K age divisions will include under 18 years old, 18-25, 26-35, 36-45, 46-55, 56-65, 66-75 and 76 or older. Age division winners will win prizes, as will the overall 5K winners. The Grand Prix 5K, organized in conjunction with Run Racing, joins the Grand Prix Foundation’s popular Monte Carlo Night, taking place April 12 at the Renaissance Hotel in downtown Long Beach, as events that will raise money for the Grand Prix Foundation’s charitable endeavors, which include funding for Long Beach area charities that include the Long Beach Special Olympics, Ronald McDonald House, Century Club, Operation Jump Start and many others. The Grand Prix Foundation of Long Beach is a 501 (c)(3) publicly supported organization whose purpose is to raise funds through a series of charitable events held in conjunction with the Acura Grand Prix. With the Foundation’s low administrative costs, approximately 90 cents of every dollar raised goes to benefit Long Beach charities every year. For more information and to register for the event, visit thegrandprix5k.com. LONG BEACH, Calif. (Feb. 20, 2019) – Prolific American racing artist Randy Owens has been named Official Race Artist for the 2019 Acura Grand Prix of Long Beach. Owens has established himself in the American racing art scene, having produced over 300 handmade serigraph editions in his realistic style — modern and evolutionary, with color and motion as the central theme. He has created poster art for Long Beach races eight times, including the Grand Prix’s 40thanniversary edition in 2014, as well as posters for the Miami Grand Prix, US Grand Prix at Indianapolis, Road America Historic Races and the Bahrain International Circuit. And, since 1991, he has also produced an annual motor racing calendar for Bridgestone. Owens currently lives and works in Pasadena, Md., with his wife, Rebecca, and youngest son, Ross. LONG BEACH, Calif. (Oct. 18, 2018) – Next April 12-14, racegoers will get to experience exhilaration as tickets for the 45th Grand Prix of Long Beach go on sale Monday at 10 a.m. PT. 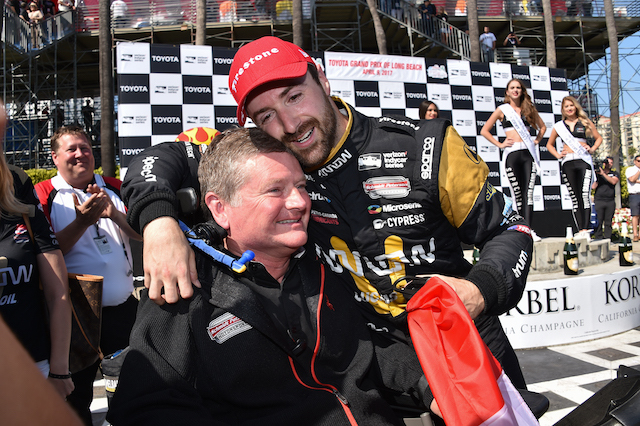 Featuring a variety of on- and off-track activities for the entire family, the Grand Prix will be headlined by the fourth round of the 2019 IndyCar Series, expected to include celebrated drivers such as five-time series champion Scott Dixon, defending Long Beach winner Alexander Rossi and past Long Beach winners James Hinchcliffe, Simon Pagenaud, Will Power and Ryan Hunter-Reay along with Marco Andretti and Graham Rahal driving wheel-to-wheel on the famed 1.97-mile, 11-turn circuit through downtown Long Beach. In addition to the Indy cars, the 2019 Grand Prix of Long Beach will feature the third round of the 50thAnniversary season of the IMSA WeatherTech SportsCar Championship, featuring prototype and GT sports cars; the Motegi Racing Super Drift Challenge on Friday and Saturday nights; the powerful sports cars of the Pirelli World Challenge, and the new-for-2019 Historic IMSA GTO Challenge, celebrating classic IMSA sports cars from the 1970s, ‘80s and ‘90s. One additional racing event will be announced soon. The event’s family entertainment menu also includes free Friday and Saturday night concerts and the Lifestyle Expo featuring a large Family Fun Zone with racing simulators, kids’ racing cars, computer games and action sports. Add to that driver autograph sessions from all racing series, special events and exhibits highlighting the Grand Prix’s history, the popular Food Truck Experience and Sunday’s Mothers Exotic Car Paddock, it’s a weekend that will be packed full of activity. The unchanged ticket prices range from $33 for a Friday General Admission ticket to $147 for a three-day ticket that includes Saturday and Sunday reserved seating in grandstand upper levels. Pre-paid parking packages are also available, along with handicapped seating, IndyCar Series Paddock access passes, Super Photo tickets and an array of VIP Club packages. Beginning at 10 a.m. PT on Monday, fans can select and pay for their 2019 Grand Prix of Long Beach seats, parking and paddock passes online at gplb.com. Ticket orders can also be placed by calling the toll-free ticket hotline, (888) 827-7333. A printed ticket brochure that includes a circuit map, ticket prices, order form and other information is also available.